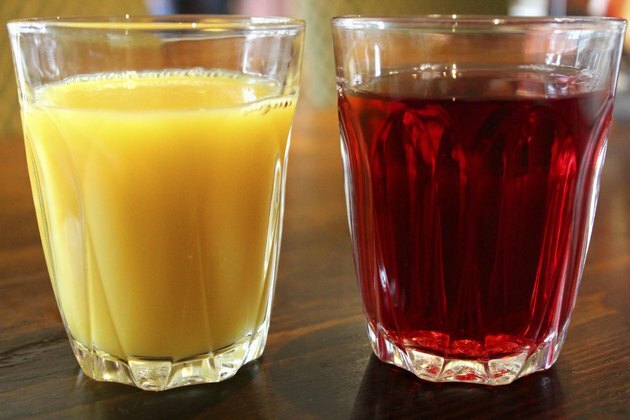 Orange and cranberry juice both offer up health benefits, but when you combine them you can pack a lot of nutrition into one glass of juice. For people who have trouble meeting fruit intake recommendations, adding a glass of 100 percent juice can help, according to Fruit Juice Facts. However, even 100 percent fruit juice contains more calories than whole fruit so moderation is important. Both cranberries and oranges are good sources of vitamin C and combined into juice, the mixture packs a large dose of this important nutrient. Vitamin C is vital for your body to effectively heal wounds and helps keep your teeth and gums healthy, reports the Centers for Disease Control and Prevention. If you can't find a 100 percent fruit juice mixture of cranberries and oranges at the supermarket, it is possible to create your own with a blender or juicer. Adequate daily intake of vitamin C also helps your body fight off infections and can decrease the amount of time you spend suffering when you have the common cold. Most fruit is good for keeping you healthy and preventing many health conditions, and cranberries and oranges are no exception. Both fruits are high in antioxidants that fight free radical damage, which can help reduce your chances of developing cancer. In addition, adequate fruit intake, whether whole or in juice, can help prevent heart disease and can help you maintain a healthy weight. According to Fruit Juice Facts, fruit, cranberries and oranges included, contain phytochemicals, which are unique compounds found in plant foods and are important because they work with the fiber in your diet to protect your body from DNA damage that can lead to diseases. When cranberries and oranges are juiced, their phytochemicals are preserved so you can still reap their benefits. When fruit sits in the bin at the store for extended periods of time the nutrients it contains begin to deteriorate. However, juice, including cranberry orange juice is typically made from raw fruits so the nutrients are preserved. This makes it easier for you to get adequate amounts of the nutrients contained in these two fruits. In addition, juice made from cranberries and oranges contains iron, something many people don't get enough of in their diet. Overall, if you don't care for whole fruit or find it difficult to get enough, adding 100 percent fruit juice to your eating plan can keep you healthy by helping you reach your daily recommended totals for vitamins and minerals that support good health, reports Fruit Juice Facts. Why Is Orange Juice Healthy?